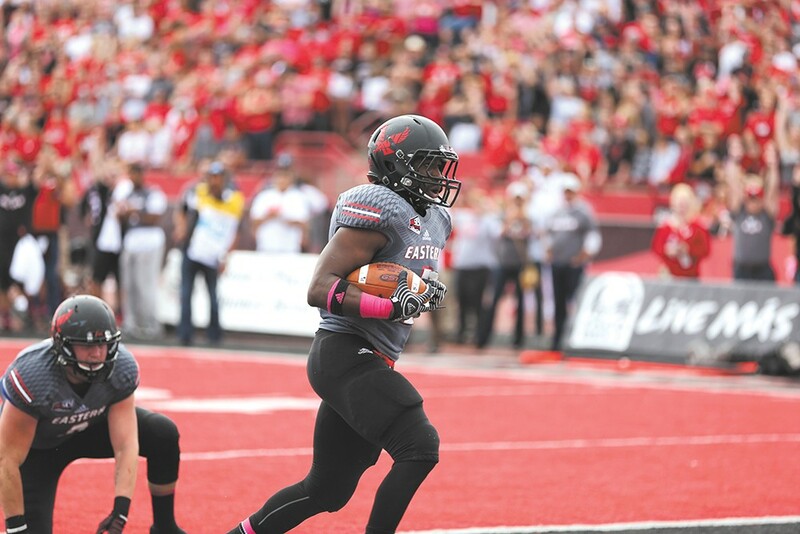 Eastern Washington won a wild overtime thriller in Cheney against Cal Poly. College football fans around the Inland Northwest probably found their fingernails a bit shorter by Saturday evening. Both Washington State and Eastern Washington used insane last-minute drives in the fourth quarter to take their respective games to overtime. In the end, WSU topped Oregon 45-38, their first win over the Ducks since 2006, while EWU pulled out a 42-41 win in Cheney against Cal Poly. Here's a quick look into a few of the numbers from those games. 1 second That's how much time remained in the game when Cougars quarterback Luke Falk found Dom Williams in the end zone; the extra point tied the game at 38. 1 play That's all the Eagles needed on offense in overtime. Quarterback Jordan West tossed a 25-yard pass to Kendrick Bourne on the first play of the bonus period. Cal Poly also scored quickly, but failed to convert a two-point conversion, giving EWU the win. 505 yards The season-high passing total for WSU quarterback Luke Falk on 74 passing attempts, also a season high. 33 mph The highest wind gust recorded during the game at EWU, which hampered the Eagles' passing attack. Still, West managed to complete 27 of 35 passes for 224 yards. 8 games Losing streak to the Ducks the Cougars snapped with their big win down in Eugene. 57,775 The number of stunned Duck fans left with their jaws on the ground after WSU safety Shalom Luani intercepted Oregon in the end zone to seal the double-overtime win.